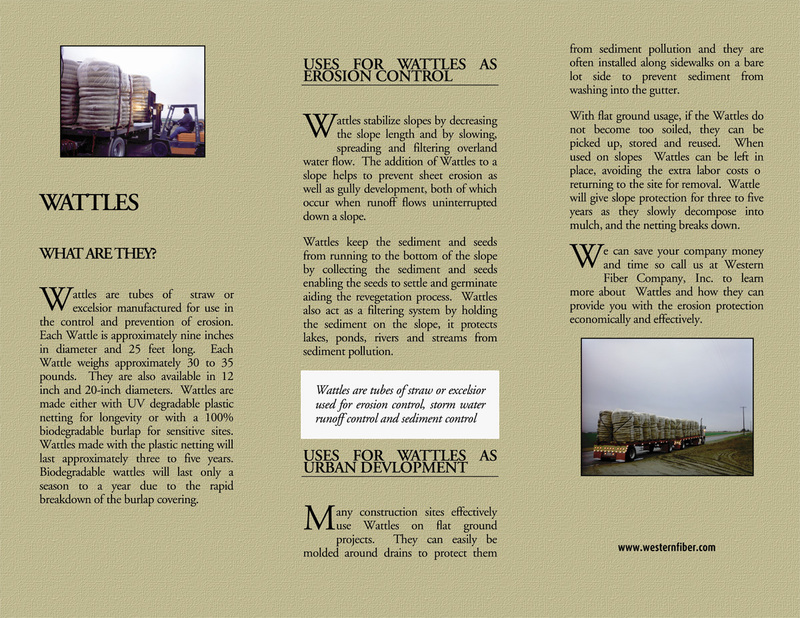 WESTERN FIBER COMPANY straw erosion control blankets provide protection to bare soils and help reduce erosion. Blankets also provide an organic cover which protects seeds and assists in the germination process. WESTERN FIBER COMPANY blankets are unique in that they are manufactured out of Certified Cal-Ag straw which allows for a fuller and more even spread of the material throughout the blanket. All blankets are individually wrapped and packaged in a unique pack that allows for a fast unloading process. WESTERN FIBER COMPANY blankets are manufactured using two types of materials - straw and Coirnut fibers. Straw blankets are considered short term and last approximately 45-60 days. Blankets engineered with coconut fibers provide longer and better protection against erosion problems and can last up to two years. Straw:single & double, 100% agricultural straw. *Products available in photodegradale and biodegradable materials and 8 ft. and 16ft widths.